Jenny Henry has cheered for volleyball, football, basketball, baseball, lacrosse—any sport her kids have picked up, she’s been right there with them, wearing the team colors and helping to guide them through major life decisions. Hayden, Mark, Hunter, Hope, Jenny and Hudson Henry cheering on Hunter as he accepted the 2015 John Mackey award for best tight end in the nation. 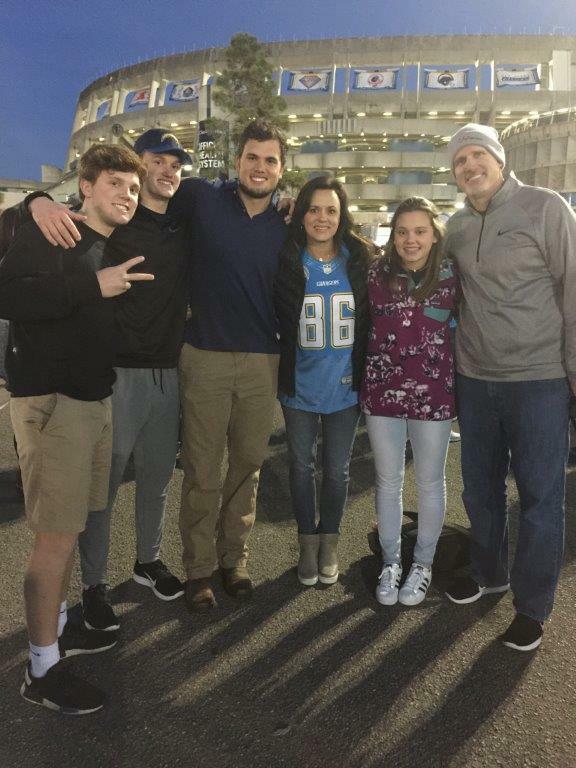 This season, you’ll find Jenny Henry in the stands rooting for her four athlete children four days a week, and making time to recharge her faith and support her husband, Mark, on Sundays in the sanctuary of Fellowship Bible Church where he is a pastor. Sports are in the Henry family’s blood. Jenny’s father played basketball at the University of Arkansas, Jenny was a swimmer and cheerleader, and her husband, Mark, also played football for the University of Arkansas. Now her son Hunter, 22, plays professional football as a tight end for the Los Angeles Chargers after a successful career at the University of Arkansas; Hayden, 18, is beginning his freshman year as a linebacker for the Razorbacks; Hudson, 16, plays football at Pulaski Academy and is ranked among the best tight ends in the country for his class; and Hope, 13, plays volleyball and cheers at Pulaski Academy. The Henrys have always been supportive of their kids’ passions and have made it a rule in their family to cheer for and encourage each other. While they ask that the kids commit to only one sport per season to keep them from over extending themselves, Jenny and Mark let the each of them find their own paths, and never pressure them—even as the stakes get higher. While all three Henry boys have fallen into football, it wasn’t the sport they grew up loving. “Hunter played football one year in kindergarten and didn’t play again until fourth grade. He played basketball and baseball until he was in the ninth grade, when we moved to Little Rock. He was a huge basketball player up until then and had played on an AAU team. He had planned to quit football if we stayed in Atlanta and focus on basketball. When we moved he started at Pulaski Academy and it is such a huge football school, it gave him a whole new lease on football and it became his love. It’s interesting to think what would gave happened if we hadn’t moved back,” Jenny said. Jenny, Hudson, Mark and Hayden after an away game playing for Pulaski Academy in 2016. Hayden and Hudson were both devoted lacrosse players in Atlanta, but they too caught football fever in Arkansas. Hope, still just 13, has dabbled in soccer, cheerleading and basketball, and recently found her passion in volleyball. “We told all of our kids, ‘You don’t have to play college football because Dad did. Even when offers came I remember sitting down with Hunter and saying, ‘If this isn’t what you want to do, you don’t have to,'” Jenny said. To deal with her fears, Jenny got the idea from a friend to write Bible verses on the backs of buttons to wear over her heart during games. “Making these buttons gave me a tremendous amount of peace. Them playing football can really grip me with fear and worry, and creating these buttons has been my calming force,” she said. As a mother, Jenny wants to protect her kids from the physical dangers of sports, but when they advance on to play at the college level a whole new world of off-the-field concerns enter the picture. This begins with the intense process of college recruiting, and helping to guide them to make decisions that could ultimately change the course of their lives kept Jenny and Mark on their toes. “Recruiting is an overwhelming process. I know that there are a lot of kids that don’t have much parental guidance, and I know after watching my kids go through it that recruiting really messes with you. You go to these schools and it so exciting and glamorous and you get on this high and you really have to come down to earth and say, ‘Let’s look at this logically, put it on paper and think about the pros and cons,’” she said. It’s not only the school’s reputation and team rankings the Henrys have to think about, but the coaches of the teams as well. As parents, they are essentially handing their child over to a team of coaches who will become primary mentors in their athlete’s life. At this point the Henrys have a University of Arkansas legacy going, but they are careful not to put that pressure on Hudson. “Just because his brothers went to UA, I don’t want him to feel pressure to commit. He has several offers and there’s still time. I’m sure he feels some pressure, but we tell him if he wants to go somewhere else we understand that. I don’t know what he’ll choose. He loves Arkansas and he’s a huge Razorback fan, but he’s keeping an open mind. I will wear whatever colors. I will be a dual fan if I need to. I’ve told him, ‘No matter where you are I’m a fan of you,’” Jenny said. Hayden, Hudson, Hunter, Jenny, Hope and Mark on New Year's Day in front of Qualcomm Stadium in San Diego, the former home of the Chargers. Her schedule is still jam-packed however, with volleyball practice Mondays and Wednesdays and games on Thursday, Hudson’s football games Friday nights, trips up to Fayetteville Saturdays to see Hayden, catching Hunter playing on Sundays when they can, and making it back for church on Sunday. In addition to Jenny’s cheer career, she also helps out with her dad’s business two days a week and every now and then steals away a moment or two for herself for prayer and quiet time.